This article is about the county in eastern Texas. For the city of Houston in southeast Texas, see Houston. For its county, see Harris County, Texas. 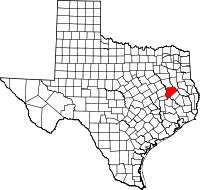 Houston County is a county located in the U.S. state of Texas. As of the 2010 census, the population was 23,732. Its county seat is Crockett. Houston County was one of forty-six prohibition or entirely dry counties in the state of Texas, until voters in a November 2007 special election legalized the sale of alcohol in the county. The Houston County Courthouse in Crockett is located at the intersections of Texas State Highway 21 and U.S. Highway 287. Houston County was the first new county created under the 9-year Republic of Texas on June 12, 1837. The original boundaries of Houston County also included all of present-day Anderson and Trinity Counties, and portions of present-day Henderson and Polk Counties. The county is named for Sam Houston, a president of the Republic of Texas and Governor of Texas. Other than being named for the same person, Houston County is not related to the City of Houston, which is located approximately 100 miles (160 km) to the south, in Harris County. A county historical museum is located in a former railroad depot, located on First Street in Crockett. The Houston County Museum is located in a restored railroad depot south of Crockett. Samuel Cartmill Hiroms (1836–1920) was born in present-day Polk County, his parents having been among Stephen F. Austin's "Old 300" families. Hiroms was an educator and a surveyor who served in the Confederate Army. He and his second wife Emily Ann (née Johnston, 1853–1948) settled in the Creek Community of Houston County. Their homestead was adjacent to what is now the Austonio Baptist Church on State Highway 21 in Austonio, Texas. Collin Aldrich (1801–1842) was a veteran of the Battle of San Jacinto and was the first judge in Houston County, having served during the Republic of Texas from 1837-1841. Eli Coltharp established his Coltharp Hill in Houston County near Kennard. The store, post office, gristmill, cotton gin, blacksmith shop, and millinery shop were located on the stagecoach route west of Nacogcoches in Houston County. When the railroad bypassed the Contharp Community, many of the residents relocated to work at a nearby sawmill. James Murphy Hager of Kentucky and his wife Nacoma (née Clark) established the Hagerville Community in the 1840s. Hager was a farmer, cabinet maker, and blacksmith. The stagecoach from Nacogdoches to Navasota, ran beside the Hagers' log home. One of the Hager sons donated land for a church and a school. There was a post office at Hagerville from 1891-1905. The Four C Mill operated in Houston County during the first two decades of the 20th century. R.M. Keith, agent of the Central Coal and Coke Company in Kansas City, Missouri, began buying virgin timber in the fall of 1899. Lumber to construct the new mill was cut by a small sawmill purchased in early 1901 from J.H. Ratcliff. Keith organized the Louisiana and Texas Lumber Company to operate the Four C. The mill was producing 300,000 board feet of lumber per daily by June 1902. Ratcliff Lake, now a United States Department of Interior recreational site, was the millpond for the Four C. The Texas Southeastern Railroad laid track from Lufkin to haul out the lumber. The town of Ratcliff was separated from the Four C by a fence, built to discourage the mill workers from spending their money outside the company town. The 120,000 acres were in time exhausted, and by 1920, the mill shut down. Ratcliff Lake Recreation Area is located in the Davy Crockett National Forest in Houston County east of Crockett. According to the U.S. Census Bureau, the county has a total area of 1,237 square miles (3,200 km2), of which 1,231 square miles (3,190 km2) is land and 5.7 square miles (15 km2) (0.5%) is water. As of the census of 2000, there were 23,185 people, 8,259 households, and 5,756 families residing in the county. The population density was 19 people per square mile (7/km²); it had the second lowest population density for all counties in Deep East Texas, behind only Newton County. There were 10,730 housing units at an average density of 9 per square mile (3/km²). The racial makeup of the county was 68.57% White, 27.93% Black or African American, 0.26% Native American, 0.25% Asian, 0.06% Pacific Islander, 2.17% from other races, and 0.76% from two or more races. 7.50% of the population were Hispanic or Latino of any race. There were 8,259 households out of which 28.70% had children under the age of 18 living with them, 51.90% were married couples living together, 14.20% had a female householder with no husband present, and 30.30% were non-families. 27.90% of all households were made up of individuals and 15.10% had someone living alone who was 65 years of age or older. The average household size was 2.44 and the average family size was 2.97. In the county, the population was spread out with 23.20% under the age of 18, 6.80% from 18 to 24, 27.70% from 25 to 44, 24.30% from 45 to 64, and 18.00% who were 65 years of age or older. The median age was 40 years. For every 100 females there were 114.10 males. For every 100 females age 18 and over, there were 115.90 males. The median income for a household in the county was $28,119, and the median income for a family was $35,033. Males had a median income of $29,143 versus $19,885 for females. The per capita income for the county was $14,525. About 15.60% of families and 21.00% of the population were below the poverty line, including 28.30% of those under age 18 and 18.20% of those age 65 or over. Eastham Unit, a Texas Department of Criminal Justice prison for men, is located in an unincorporated area in the county. The Crockett State School, a Texas Youth Commission juvenile correctional facility for boys, was located in Crockett. but was closed on August 31, 2011. Chuck Hopson, a pharmacist from Jacksonville, is the Republican member of the Texas House of Representatives whose District 11 includes Houston County. Houston County is served by US Highway 287 and State Highways 7, 19 and 21. All of these highways intersect at the Courthouse Square in downtown Crockett. SH 21 follows the 300-year-old route of the El Camino Real de los Tejas National Historic Trail. Texas State Highway Loop 304 circles the city of Crockett. Freight rail service is provided by Union Pacific Railroad. The Crockett Depot, built in 1909, has been restored and now serves as the Houston County Museum. Houston County Airport (KDKR), located 3 miles east of Crockett on SH 7, features a 4,000-foot runway. On site aircraft services are provided by East Texas Aircraft. Demand and Response public transportation within Houston County is provided by Brazos Transit District. In addition, small portions of Groveton Independent School District and Elkhart Independent School District, located in Trinity County and Anderson County respectively, extend into Houston County. ^ Gannett, Henry (1905). The Origin of Certain Place Names in the United States. Govt. Print. Off. p. 161. ^ "Eastham Unit Archived 2010-07-25 at the Wayback Machine." Texas Department of Criminal Justice. Retrieved on July 16, 2010. ^ "TYC Announces Closure of Three Facilities Archived 2012-03-05 at the Wayback Machine." Texas Youth Commission. Retrieved on July 3, 2011. Wikimedia Commons has media related to Houston County, Texas. Wikisource has the text of an 1879 American Cyclopædia article about Houston County, Texas.